The Sacrament of Confirmation presents a thorough preparation of the celebration of Confirmation for Grades 7 to 9. This new textbook will help guide the confirmand through prayer, discernment, and a deeper conversion of the faith. Each chapter includes tools—various exercises and activities—designed to help foster meaningful discussion with the confirmand’s parents and sponsor during this preparation. Midwest Theological Forum is proud to offer The Sacrament of Confirmation, which is our first book in the Didache Sacramental Preparation Series. This series stands alongside the Didache Complete Course Series, the Didache Semester Series, the Didache Parish Series, and the Didache Bible. It was prepared for the catechetical needs of dioceses across the country and in accordance with guidelines from the Committee on Evangelization and Catechesis of the U.S. Conference of Catholic Bishops. This book was designed with preteen and early teenage students in mind, but it may be used profitably by Catholics of all ages. My prayer is that it brings you toward a closer union with Christ and a deeper intimacy with the Holy Spirit, “in order to be more capable of assuming the apostolic responsibilities of Christian life” (CCC 1309). I encourage you to read the material at the end of each chapter. These special sections will teach you how to pray and discern God’s will for you (Sealed in the Spirit). They will also strengthen your relationship with your parents, who are your first teachers in the faith (You and Your Parents), and help you grow in spiritual friendship with your sponsor (You and Your Sponsor). Most especially, since the Holy Spirit’s “actions, his gifts, and his biddings” (CCC 1309) can be seen most clearly in the lives of the saints, each chapter highlights a particular holy person who has powerfully manifested the fruits of the Holy Spirit. As you read the stories of these heroic Christians, I invite you to pray for their intercession and open your heart to a closer friendship with each of them. 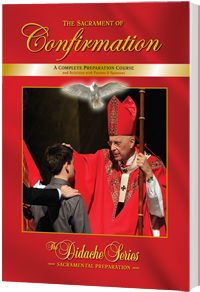 I hope you enjoy this book as you prepare—with the loving help of your sponsor, parents, catechist, parish priest, bishop, guardian angel, and patron saint—to receive the Sacrament of Confirmation.